Examining the history of the convenience store is like staring into a microscope aimed at the beating heart of American culture. It origin story was molded around the car culture that new American cities were built on. Back in 1927 household refrigeration was still done using large blocks of ice that needed to be constantly replaced. In Texas, one of the hottest and most spread out states, that meant that you were never too far from a roadside ice stand. These stands were open long hours (you never knew when you would need to run out and get more ice before all of your food spoiled) and one enterprising “Ice Dock” owner in Oak Cliff, Texas named “Uncle Johnny” Jefferson Green decided that he might as well sell milk, bread and eggs as well. The Southland Ice Company saw potential in this arrangement (and probably threat from the spread of cheap refrigeration technology) and by 1946 had applied this concept to many of their locations. These convenient and practical places to buy staples were open from seven in the morning to eleven at night every day and eventually came to be called what we know them as now: 7-Eleven. It is no surprise that convenience stores are an American invention. Anyone that spends even a small amount of time in the U.S. always comments on how much we prioritize convenience like drive-through restaurants and twenty four hour grocery stores. But at this point, the convenience store has become a global phenomenon. The top three countries for convenience stores per capita are South Korea, Taiwan and Japan. In 1991 Southland Ice Company filed for bankruptcy and two Japanese companies bought a $430 million stake in the company and in return for 70% control. Convenience stores have also left their mark on the same modern American cities that created the need for them. The ability for a small store to act as the de-facto retail and grocery location for large swaths of residential or commercial zoned areas is one of the reasons that American cities have so little mixed-use retail buildings. It also has also been cited as one of the reasons that so many Americans live in “food deserts” that have little access to affordable and healthy food. But the nature of the convenience store is changing in a way that can help it heal some of the second-order ills that it caused. Yesterday building amenity service provider Convene announced a partnership with the tech-enabled convenience store company New Stand. The addition of easy, convenience small marketplaces will help Convene in their mission to optimize the tenant experience within buildings. Most office buildings have little to nothing to offer as far as retail goes. Being able to give occupants access to curated products like daily essentials, tech accessories and locally-made fare can give create a whole new level of connection with the spaces where we spend most of our waking lives. 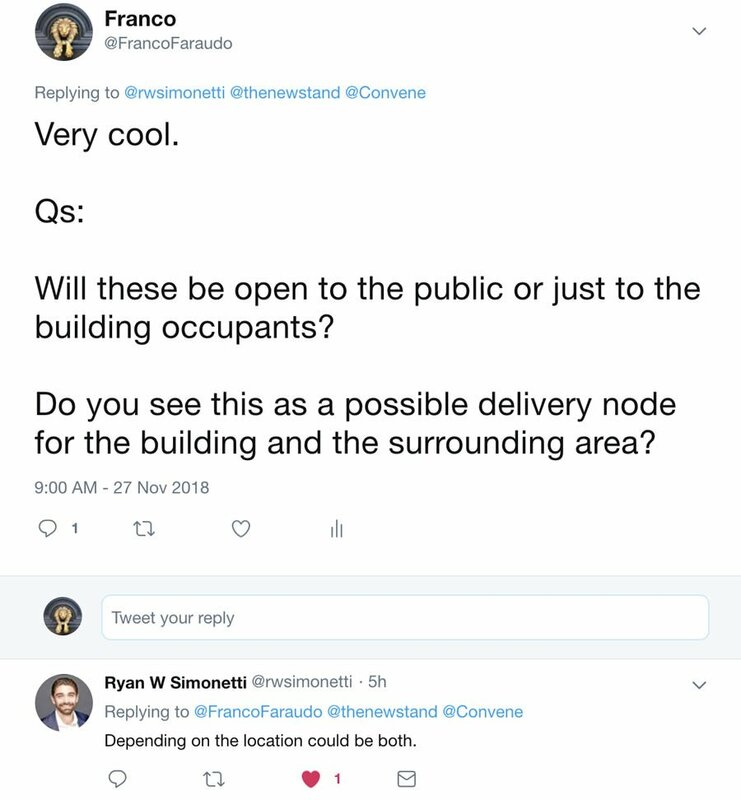 I wanted to know more about Convene’s plans for these smart little stores so, like any modern journalist, I asked him on Twitter. This goes to show that office buildings are no longer the single-use, private city center behemoths that they used to be. Soon we might see office buildings as not only a hub for innovation but for local commerce as well. If tenants, as well as passersby, are able to buy or order items from inside office buildings, it could change the value proposition of the buildings themselves. It might also help reinvent the image of the convenience store. Soon we might see convenience stores less as a place for artificial food products to be displayed under fluorescent lights and more of a cozy place to find our favorite products and possibly discover new ones.